I love this fan so much I had to write about it. I love this fan so much it made me think in reverse about all the times I wish I’d had it. Now I’ll have it everywhere I get hot. I recently switched gyms. I go on base and I have several choices of where I can go. For the past year I’d been going to the biggest one because it has an indoor track. It’s the farthest away with terrible traffic but I listened to an audiobook to get me there and back. I liked going to that one because it was so open and not as hot as the other gyms. At one of the smaller gyms there is a certain time of year that I’m there that I literally need to wear sunglasses inside, AND IT’S HOT. I stopped going to that one altogether. My favorite gym had to refinish the basketball courts, so they closed for a couple weeks for the fumes to die down. I went back to the gym where I need sunglasses and decided that one just didn’t bring me joy. Working out is not my favorite thing to do, so I at least need to be happy about where I’m going. So I went to an even smaller gym, that I stopped going to a long time ago because their ventilation was horrible. It’s been fixed. There used to be some kind of makeshift blower looking thing that you only felt it you walked past it. Now they have actual vents. But it’s still stuffy. After driving the short distance for a couple of weeks I decided I liked the quick drive better than the long drive. No more walking track but it felt like my workout was over quicker even though I was exercising for the same amount of time. Back to the fan! So I’m pretty sweaty just after 30 minutes. I guess that’s good but I don’t like to sweat like a pig. Sweating makes me watch the clock. I was thinking, I wonder if there’s a such thing as a fan that can clip on to the machines? I googled it and it led me to strollers fans on Amazon. There’s lots of them. Some look just like this one by different manufacturers with varying prices. 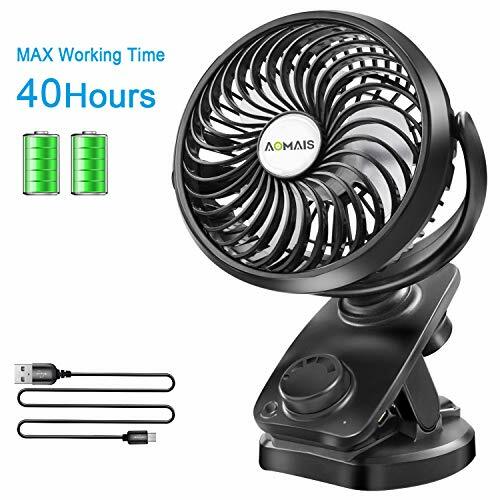 I read the descriptions carefully and went with this one because it’s also an Oscillating fan and the others are not. One charge can last up to 40 hours so I can keep it in my gym bag without charging it everyday. So I didn’t buy it just for the gym. I needed something by my bedside because I DO get hot flashes at night. I’ve had a small fan like this before but it was loud and my husband said it was too loud - insert eye roll here. We also don’t sleep with the ceiling fan on because he’ll wake up with the flu - insert an extreme eye roll here. It is as loud on the highest speed as my other one was on the lowest. I won’t need to turn it up that high by my bedside, I just need some air to blow on my face. I love it, love it, love it! Lastly I haven’t used it outdoors yet but we will be starting with shooting soccer and baseball next week. It won’t be hot hot yet, but it will be by the middle of next month and it’ll be wonderful having this oscillating fan clipped to the table and/or tent. The really SWEET thing that I think is a bonus is that you can use essential oils with it! So I will be getting another one exclusively for outdoors and using the stinky citronella essential oils on it for mosquitos. It’s going come in handy for so many things. I hope you enjoyed my review. Disclaimer: Please know that this post contains an affiliate link. This means that should you click to buy, I will receive a small commission. The price is exactly the same for you as it would be without the affiliate link.